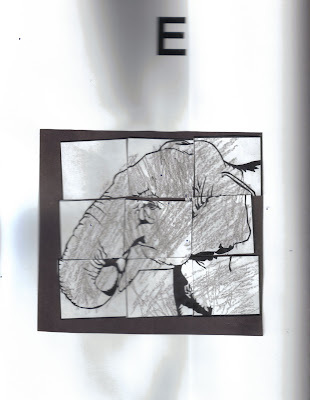 This week I divided a picture of an elephant into nine pieces as a simple puzzle for Zachary to color. He cut it following the lines and then pasted it together on a larger sheet of construction paper for his Alphabet Book. If you click on the picture it will take you to the document where you can print off the puzzle for yourself. We used 4 popsicle sticks to make the letter E together. Simple and quick! And since I'm posting this after I've already posted my "K" post, I can promise you the results were MUCH better!! For this activity you will need the following items: food coloring, several small containers, coffee filters, and eyedroppers. Fill the containers with water and put a few drops of food coloring into each container, making each container a different color. Flatten out your coffee filter as best you can. See if you can guess what colors will be made when the colors spread and run into other colors! Let the filters dry completely on either a cookie sheet or newspaper (the food coloring will stain if you aren't careful!). We had fun rolling out playdough and making our uppercase and lowercase "E's" this way. Snakes are always fun! 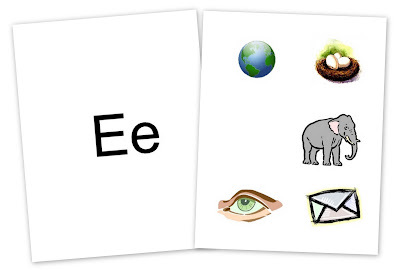 Click on the thumbnail graphic to download the Letter Ee sheet. 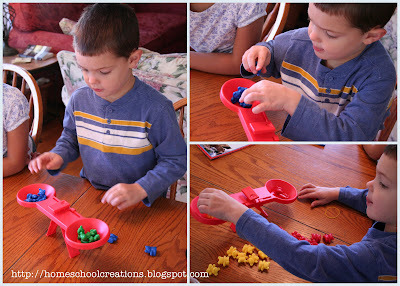 We used our scales this week (a HUGE hit) to estimate and weigh things. We started out with our counting bears and then used other things around the house to see how they weighed in comparison to the bears. Even a child is known by his deeds. This week we talked about how people know what kind of a person we are by how we act. We're using the book My ABC Bible Verses by Susan Hunt as a devotional during the week. Zachary has the basics of the uppercase E down...just a few problems in where those lines get put. Sometimes all up high. Sometimes all down low. But it's an E! We're using Peterson's Handwriting this year (you can see my reviews in the sidebar for more info on this program). Have I mentioned how much I love, love your site and resources? Thank you so much!